Broccoli has its roots in ancient Roman times when it was developed from wild cabbage, a plant that more resembles collards than broccoli. It spread through out the East where it was appreciated for its edible flower heads and was subsequently brought back to Italy where it was further cultivated. 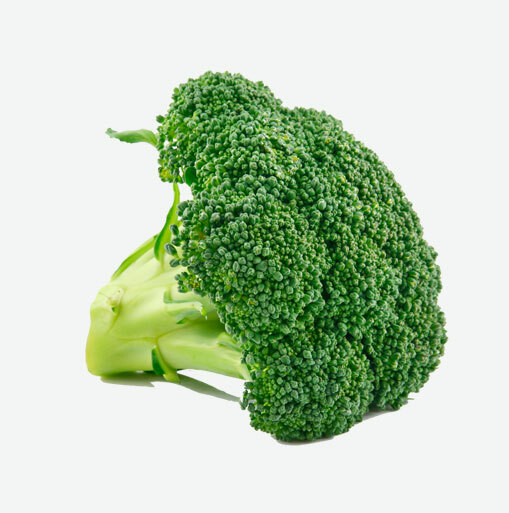 Broccoli acquired its name from the Latin word brachium, which means branch or arm, a reflection of its tree-like shape that features a compact head of florets attached by small stems to a larger stalk. Roman farmers called broccoli “the five green fingers of Jupiter.” Its colour can range from deep sage to dark green to purplish-green, depending upon the variety. Other vegetables related to broccoli are broccolini, a mix between broccoli and kale, and broccoflower, a cross between broccoli and cauliflower. Looking for a vitamin C fix? Make a beeline for the broccoli. Are your potassium stores low? Partner up with broccoli. Is fiber on your shopping list? Bring home the broccoli. Need an iron boost? Look no further than broccoli. Broccoli and other leafy green vegetables contain powerful phytochemicals or antioxidants. Broccoli is a power house of antioxidants which also benefit eye health. Choose broccoli with floret clusters that are compact and not bruised. They should be uniformly coloured with no yellowing. In addition, they should not have any yellow flowers blossoming through, as this is a sign of over maturity. The stalk and stems should be firm with no slimy spots appearing either there or on the florets. If leaves are attached, they should be vibrant in colour and not wilted. Broccoli is very perishable and should be stored in open plastic bags in the refrigerator crisper where it will keep for about four days. Since water on the surface will encourage it to rot, do not wash the broccoli before refrigerating. Leftover cooked broccoli should be placed in tightly covered container and stored in the refrigerator where it will keep for up to 2 days. Wash broccoli thoroughly just before using. Trim tough portion of the stem about one inch from the bottom. How you cut the broccoli prior to cooking is a matter of preference and the nature of the dish you are planning. For salads and stir-fries, cut the broccoli into bite size pieces. Include the stems, too. Many cookbooks will direct the cook to discard the leaves and peel the stems, but think of all the nutrients and fiber you would lose. Keep those stems in tact, and simply chop them or cut them into julienne strips to take advantage of their valuable vitamins, minerals, and phytochemicals.